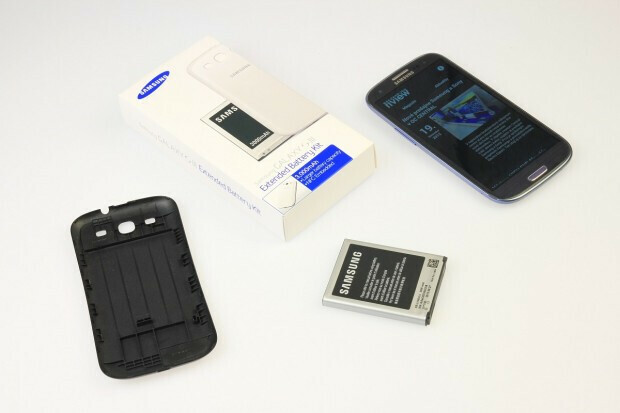 A bit more than a week ago, we told you that British retailer Mobile Fun was taking pre-orders for the official Samsung made 3000mAh extended battery for the Samsung Galaxy S III. The extended battery is expected to run two hours longer than the 2100mAh cell that comes out of the box with Sammy's flagship Android device. The only problem is that Mobile Fun is not listing a shipping date. The battery is priced at 39 GBP ($65 USD). Amazon Germany also lists the Samsung Galaxy S III extended battery, which will be available from a third party starting January 5th. The Samsung Extended Battery Kit weighs in at €39.90 ($52.76 USD) through Amazon Germany, which is cheaper than the price of the kit from Mobile Fun. The Extended Battery Kit includes the 3000mAh cell and a slightly larger back cover that accommodates the larger dimensions of the replacement cell. The kit is available in blue or white to match the colors that the phone was originally launched in. So how much thicker will your Samsung Galaxy S III be after you install the extended cell? Check out the video below. At around the 1:05 mark you will see the extended battery and the battery cover. The size difference is not that bad, as you can see. The video, which is in Slovak, also shows the size difference between a 4500mAh cell and the 3000mAh one that comes with the Extended Battery Kit. With appearances in the U.K. and now in Germany, it looks like the extended battery for the Samsung Galaxy S III is slowly making its way around Europe before possibly ending up in the U.S.
bigger battery to prolong your horrible experience with samsung phones. you guys are all undoubtedly stubborn and inflexible when it comes to your crapdroid blindness. Bunch of ignorant sheeps. Try harder. Why do you care what phone we use? You are just some ignorant person. Apple fan or Android. Both will agree you are just a troll. Dang you have a lot of dislikes! i speak both russian and german... that sounded like a mix of the two...what language is that? Slovakia... the question is where are YOU from ? Not sure if it's worth buying it for normal day to day use, but it looks likes a pretty useful for when going away for a few days and you're not sure if you'll get the chance to charge the phone. The 3000mah looks perfect for my use. I don't like super thin phones anyway. Hurry and bring it to the states please. and non removeable battery, leading to expensive repairs if your battery craps out for whatever reason after the warranty's up. And not an inch thick. Surely that would make it heavier than the Lumia 920, which I find ironic considering reviewers criticized it for being too bulky. This is not Slovenian... It's from Slovakia... so, it's Slovakian, or Czech.